Who Really is Sugar's Furry Friend? 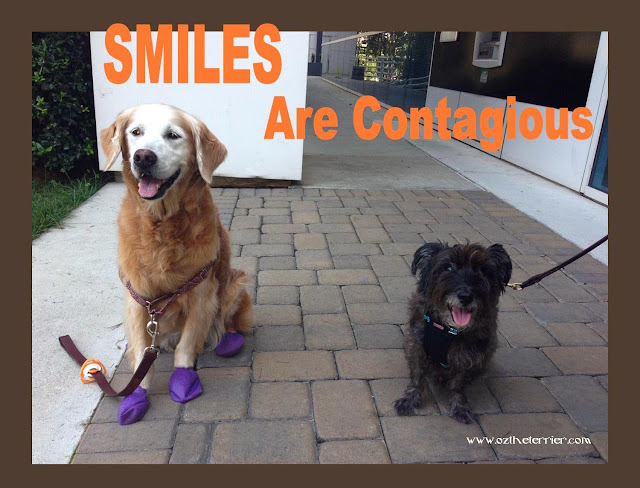 I know you are thinking to yourself..."Oz, we all know Sugar's Furry Friend is a chipmunk". And yes, if you read Sugar the Golden Retriever's book, Sugar's Furry Friend, "a chipmunk" would be your answer. Now, Sugar is a good friend of mine and she recently sent me a surprise package! In that package was of course, a copy of her book. Thank you, Sugar! I took it to my comfy spot on the couch and began to read all about how Sugar met a chipmunk in her backyard and how they became good friends. I loved reading all about their adventures. The book's illustrations are terrierific! 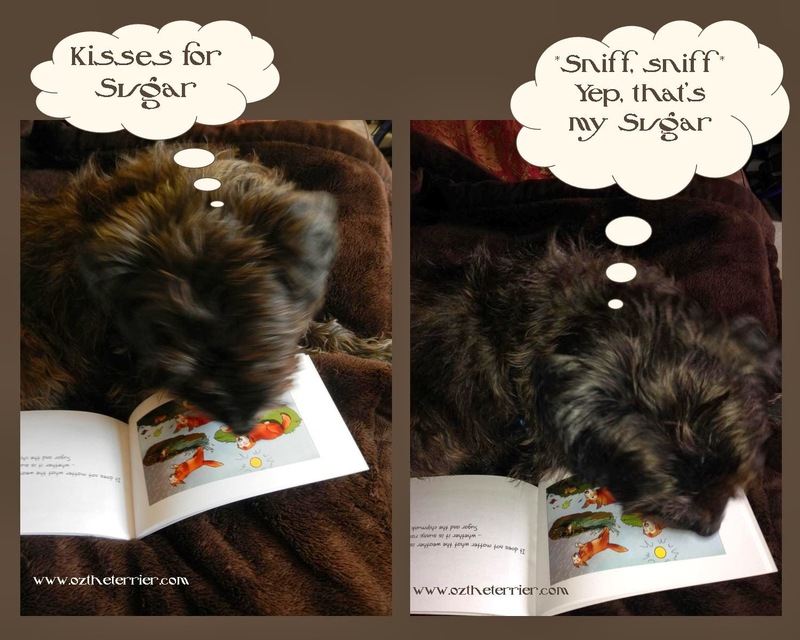 I found Sugar on almost every page...I gave her a few sniffs and kisses while reading. I love illustrated Sugar! 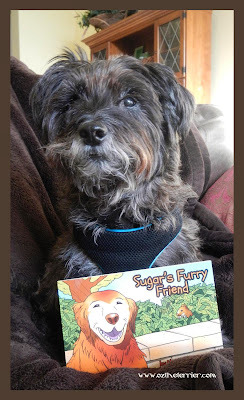 Sugar's Furry Friend is a great book for children and I highly recommend it. Now, that wasn't the only thing Sugar sent me in my surprise package. Back when we were at BarkWorld, Sugar's mom took photos of me because she wanted some practice photographing darker colored dogs. She said she would share the photos with us and so she included them in my surprise package. It's not easy taking photos or photos! Sugar's mom is as sweet as well...Sugar! Can you believe she printed and matted the photos for us?! She sent us two copies of each of three photos...in color and in black and white. Ma already framed one for Daddy-dog to take to his office. I just LOVE the photos! THANK YOU Sugar's mom! Now again, I ask you...Who Really is Sugar's Furry Friend? I believe it is ME!! Why else would Sugar send me such a terrierific surprise?!? I am so thankful to Sugar for my super surprise and especially for being my friend so I am joining the Thankful Thursday blog hop! What a lovely surprise from Sugar. I love the photos. I can't wait to see you both again. I can't wait to see you both again!! You both are so cute!!! Oz that is such a sweet surprise from Sugar. How kind. Have a tremendous Thursday and Happy Halloween to all your family. Hope it is a spectacularly good spooky one. It was very kind, indeed Molly. I need to stop by your blog and wish you a Happy Howloween! I bet hamburger would make you smile. BOL Sweet Wills, you are one funny dude! Oh absolutely, Mad Scots...you are some of my bestie friends too! Was it a secret?!? Oh, I am a dog with a BIG mouth, I guess. BOL I did smell your Golden pawprint. Thank you for my terrierific surprise! So cute and sounds like a pawesome book! Happy Halloween Oz, from Ku and the whole pack. Come on over a pawtyhop with us! BOOOWOOOOBOOOOOOO! Happy Howloween, Ku! I'll be right over! What a fun surprise! The fur-tos of you are fabulous! We know Sugar and her mom are super sweet cuz they made my book trailer video for me! Oh that's right! Aren't they just the sweetest?!? What a great surprise, Happy Halloween. Pawesome, Madi! I am so glad you LOVE it! That's pawsome Oz, you look wonderful in the photos. This isnso cool Oz...and so is Sugar! Happy Halloween dear friend! She really is! happy Howloween! What a great surprise. Sugar's mom is very kind and did a great job taking photos of handsome you! Have a great Halloween. How awesome is that! Happy Howloween!!! What a great friend Sugar is! So cool you met each other in the fur! Mom has Sugar's book on her tablet. Great review Oz!!! 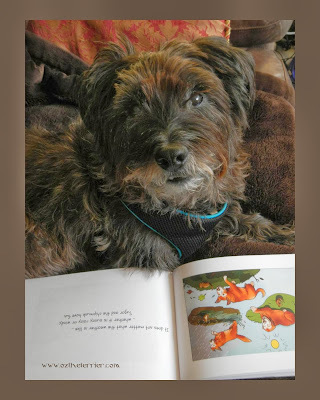 Dakota read Sugar's book a few months ago and he had it on his blog too, he LOVED it as much as you did!!! HAPPY HALLOWEEN!! I won a copy of her book a few months ago. It's super cute and the kids love it! 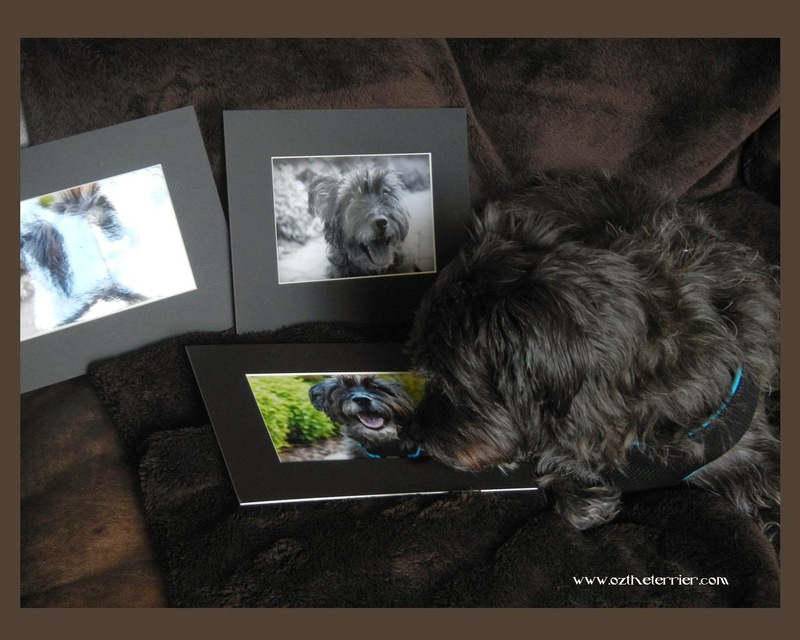 And those photos are really really nice... and Sugar's mom is so nice to get them printed all fancy like for you! Those are some of the best photos of you I've seen Oz...You look mahvelous! Oh Sugar is such a sweetie. And I lvoe your photos, you look sooo happy! Oh, I've read Sugar's book!!! Ma downloaded it to her Kindle thingie, and read it to me! It was FABulous!!!! Sugar's book sounds absolutely super, the illustrations are so good! You're lucky to have such a great friend. Wowee, those pictures are just lovely! Eve finds it hard to take good pictures of me, so these look amazing! And, of course, the dog in them is amazing! Sugar's mom did a great job on the pictures! Wow now that is a CARE package! And everyone knows Sugar is a very caring friend!